The Life and Times of E.J. Phillips is a website dedicated to documenting the way a stage actress made a life and a career for herself between the 1870s and 1890s. By working the way through her letters, an unusually detailed picture emerges. The information on housekeeping and boarding house life is especially interesting. Especially interesting is this Google map that takes you on a walking tour of Manhattan as E.J. Phillips experienced it. 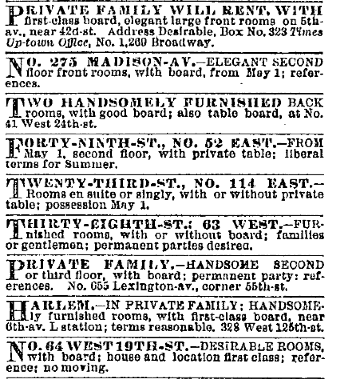 Boarding or lodging houses were also popular in the poorest neighborhoods, but these were not advertised in the paper. 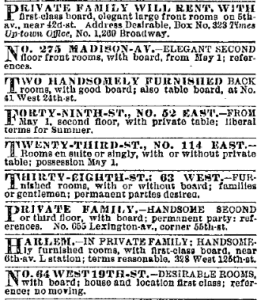 Note that the excerpt below mentions only men in connection with these lodging houses, and the price — ten cents or less (in 1868) to stay overnight in a communal room. Source: McCabe, James Dabney, and Charles Lawson. 1868. The Secrets of the Great City; a Work Descriptive of the Virtues and the Vices, the Mysteries, Miseries and Crimes of New York City. Philadelphia: Jones Brothers, 345-346. The Bowery and eastern section of the city are full of cheap lodging houses, which form a peculiar feature of city life. There is a very large and increasing class of vagrants who live from hand to mouth, and who, beneath the dignity of the lowest grade of boarding houses, find a nightly abode in cheap lodgings. These establishments are planned so as to afford the greatest accommodation in point of numbers with the least in point of comfort. The halls or rather passages are narrow, and the rooms are small, dark, dirty and infested with vermin. The bedding consists of a straw pallet and coarse sheets, and a coverlet of a quality too poor to be an object of luxury. In some houses no sheets or coverlet are afforded, but even with the best of these accommodations the lodger suffers from cold in the winter, while in the summer he is devoured with bed-bugs. For such accommodations in a room which half a dozen may share, the lodger pays ten cents, though it is said there is a lower depth where they sleep on the floor and pay half the above-mentioned price. The profit of this business may be inferred from the fact that one hundred and fifty lodgings, and in some cases a much larger number, are sold by each house, making a net receipt of $15 per night, to which is to be added the profits of a bar, where the vilest whiskey is retailed in ‘dime nips.’ The business of a lodging house seldom commences before ten o’clock, and its greatest rush is just after the closing of the theatres; but all through the night, till three o’clock in the morning, they are receiving such of the outcast population as can offer the price of a bed. To any one interested in the misery of the city, the array presented on such an occasion is very striking. One sees every variety of character, runaway boys, truant apprentices, drunken mechanics and broken-down mankind generally.Among these are men who have seen better days. They are decayed gentlemen who appear regularly in Wall street, and eke out the day by such petty business as they may get hold of, and are lucky if they can make enough to carry them through the night. In all lodging houses the rule holds good ‘first come, first served’ and the last man in the room gets the worst spot. Each one sleeps with his clothes on and his hat under his head to keep it from being stolen. At eight o’clock in the morning all over-sleepers are awakened and the rooms got ready for the coming night. No one is allowed to take anything away, and if the lodger has a parcel be is required to leave it at the bar. This prevents the theft of bed-clothes. 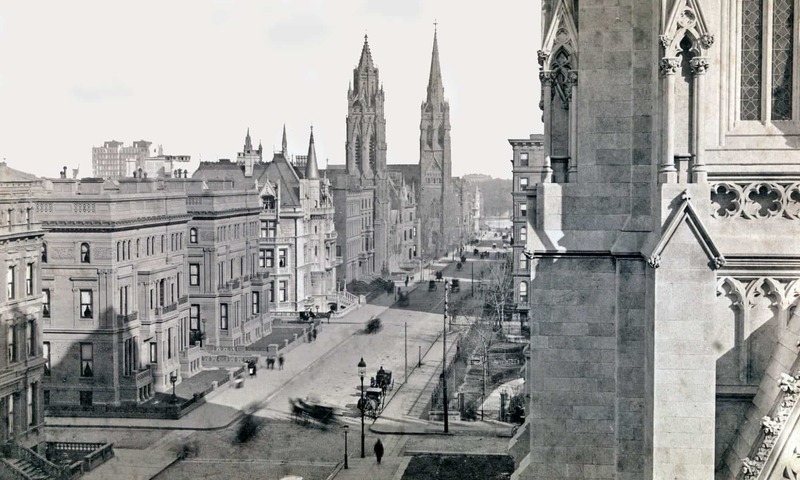 As the expenses connected with lodging houses are very light, they are generally profitable, and in some instances large fortunes have been made at the business. The one recently burned was a correct illustration of the vices and miseries of the poor; a lodging house up stairs and in the basement a concert saloon, so that the poverty engendered by the one could be sheltered by the other. 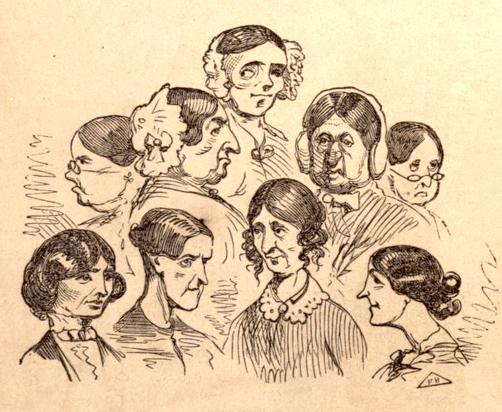 From Gunn 1857: His take on the women who ran boarding houses. The following illustration is from Groth 1994. Second-floor plan for a conjectural conversion of a large single-family row house into a rooming house. Shaded areas indicate where thin walls have been added to cut up the large rooms of this 1840s house. The warren of five rooms at the front was constructed from the two former principal bedrooms and their closets.